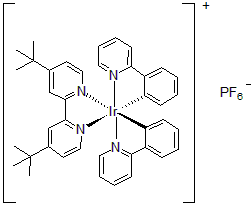 Among some of the most interesting examples, the reductive dehalogenation of alkyl, alkenyl and aryl iodides developed by Stephenson and his group highlights the use of Ir(ppy)3 as a photocatalyst.10 Using 2.5 mol% of the photocatalyst with tributylamine and either Hantzsch ester or formic acid, a variety of alkenyl, alkyl, and aryl iodides underwent reductive dehalogenation in excellent yields. 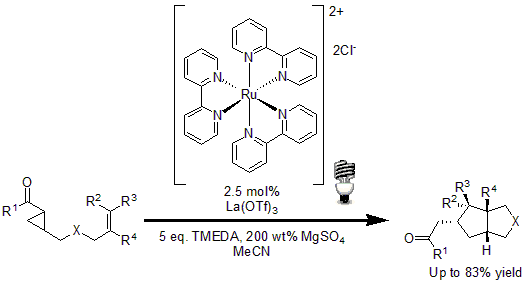 In another example of the utility of photocatalysts, Stephenson and co-workers reported tin-free radical cyclization reactions.11 Using 1 mol% of an Iridium based photocatalyst and triethylamine, a radical is generated by the reduction of an activated C-Br bond to yield the desired cyclized product of various alkenes and alkynes in good to excellent yields. 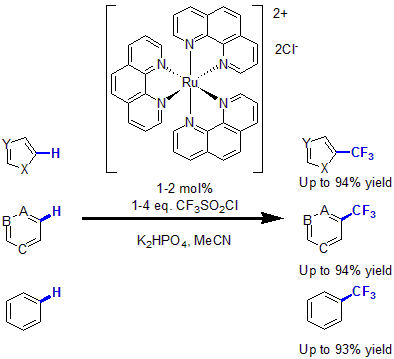 In 2011, MacMillan and coworkers, reported the first trifluoromethylation of arenes and heteroarenes via photoredox catalysis.12 Using 1 to 2 mol% of Ru(Phen)3 complex with CF3SO2Cl as the CF3 source and K2HPO4 as base, various heteroarenes as well as unactivated arenes were functionalized with a trifluoromethyl group in good to excellent yields. 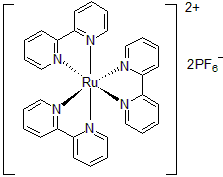 In 2011, Yoon and coworkers reported a new method for the [3+2] cycloaddition of aryl cyclopropyl ketones with olefins to yield highly substituted cyclopentane ring systems.13 Using 2.5 mol% of Ru(bpy)3Cl2 with La(OTf)3 as Lewis acid to activate the enone moiety, good to excellent yields were obtained of the desired cyclopentanes. 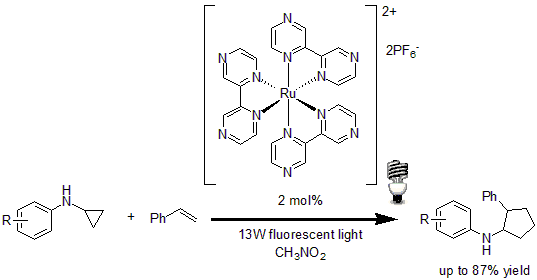 In 2012, Zheng and co-workers reported the visible light-mediated intermolecular [3+2] cycloaddition of cyclopropylamine with olefin.14 Using 2 mol% of Ru(bpz)3(PF6)2 as the photocatalyst, the method showed good regiocontrol in respect to the olefin, with a good tolerance of a variety of functional groups in good to excellent yields. 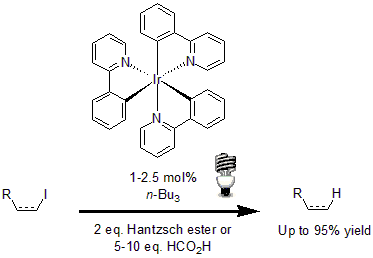 In 2011, Stephenson and coworkers developed a simple protocol for the intermolecular atom transfer radical addition to olefins. 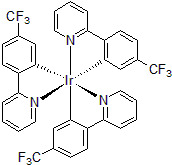 Using 1 mol% of [Ir(dF(CF3)ppy2(dtbbpy)]PF6 as the photoredox catalyst, a wide variety of halogenated compounds were coupled to terminal and disubstituted olefins in excellent yields. 1 (a) Prier, C. K. et al. Chem. Rev. 2013, 113, 5322. (b) Yoon, T. P. et al. 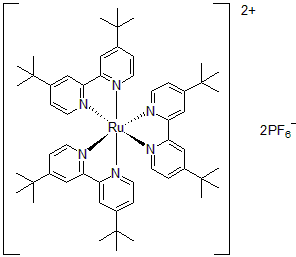 Nature Chem. 2010, 2, 527. 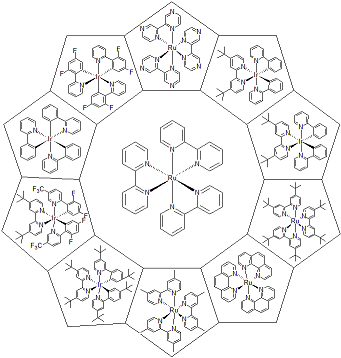 (c) Zeitler, K. Angew. Chem. Int. Ed. 2009, 48, 9785. 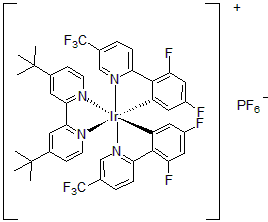 (d) Douglas, J. J. et al. Aldrichimica Acta 2014, 1, 15. 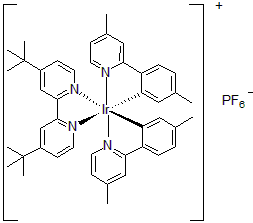 2 (a) Kalyanasundaram, K. Coord. Chem. Rev. 1982, 46, 159. (b) Juris, A. et al. Coord. Chem. Rev. 1988, 84, 85. (c) Juris, A. et al. Helv. Chim. Acta 1981, 64, 2175. 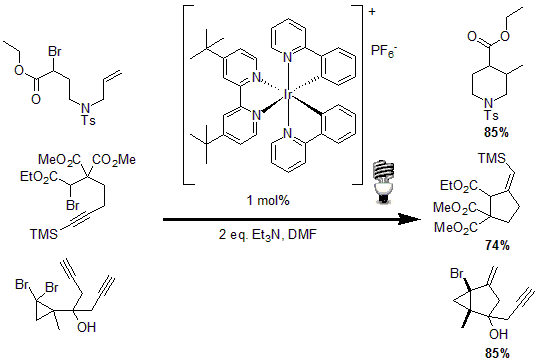 3 (a) Takeda, H. et al. Coord. Chem. Rev. 2010, 254, 346. (b) Grätzel, M. Acc. Chem. Res. 1981, 14, 376. 4 Tucker, J. W. J. Org. Chem. 2012, 77, 1617. 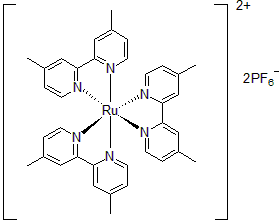 5 Pac, C. et al. J. Am. Chem. Soc. 1981, 103, 6495. 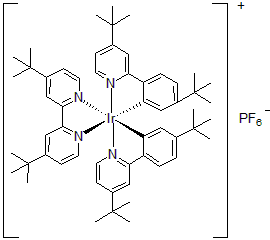 6 Nicewicz, D. A. et al. Science 2008, 322, 77. 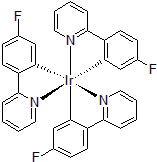 7 Ischay, M. A. et al. J. Am. Chem. Soc. 2008, 130, 12886. 8 Narayanam, J. M. R. et al. J. Am. Chem. Soc. 2009, 131, 8756. 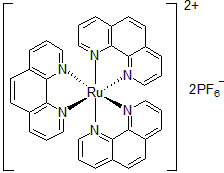 9 Nguyen, J. D. et al. 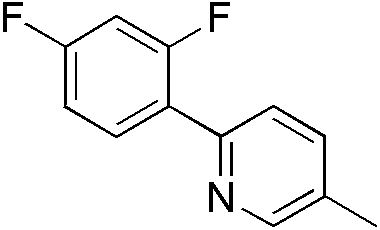 Nature Chem. 2012, 4, 854. 10 Tucker, J. W. et al. Chem. Commun. 2010, 46, 4985. 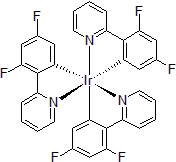 11 Nagib, D. A. et al. Science 2011, 480, 224. 12 Lu, Z. et al. J. Am. Chem. Soc. 2011, 133, 1162. 13 Maity, S. et al. Angew. Chem. Int. Ed. 2012, 51, 222. 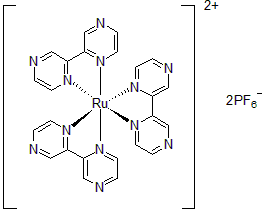 14 Nguyen, J. D. et al. J. Am. Chem. Soc. 2011, 133, 4160.